“A proper elephant skincare routine is an important part in ensuring its well being. It relieves the animal of distressing skin ailments and allows it to get a good, restful night’s sleep, meaning it is far more likely to feel contented and balanced”. I’m hearing this half-way up a beautiful, shady tree-covered mountain just outside Chiang Mai. I’m walking and talking to the enigmatic Theerapat Trungprakan (Pat), owner of the Patara Elephant Farm, a family-run conservation project that specializes in health recovery and breeding management for domestic elephants. I’m thrilled to find out that this is not a trashy tourist ‘circus’, where large numbers of ill-treated elephants are shipped in or bred to provide a cheap thrill to holiday makers. It is an educational programme founded on sound ecological and animal welfare principles, with the aim to inform and engage its visitors about the plight of elephants in Thailand. Set up 14 years ago with a just a handful of rescue elephants, Patara has fostered a well-cared for and content herd of 38 utterly charming animals, in a fivestar setting, as far as elephant accommodation is concerned. They have over 10 soccer fields worth of varying terrain for exercise, mountain paths, grazing meadows, rivers, mud baths and even an outdoor shower in the form of a waterfall and a natural plunge pool. Under the careful observation and instruction of expert mahouts, visitors can really get up close and personal; with the knowledge that the proceeds generated by the project are forming part of the solution and not adding to the considerable problems faced by many elephants across the country. After just an hour of being there, I’m overcome with just this feeling. I meet a baby elephant, who mischievously plays with me, leaning into and pushing me off balance whilst her mother watches patiently from a few feet away. Ten minutes later, she lets out a deep, loud call and without hesitating, my new friend turns on her heels and runs back to mommy, both sets of ears flapping in contentment – mine and hers. Another person at the heart of the movement to re-educate people about the role and welfare of Asian elephants is John Edward Roberts, with the unique job title of ‘Director of Elephants’ at the Golden Triangle Asian Elephant Foundation in Chiang Rai. He was employed to set up an imaginative and ethical elephant camp 10 years ago. The foundation was created specifically to help Thailand’s population of begging, street-elephants, but it has now expanded to look at the bigger picture and start doing some conservation work, as well as looking at welfare. It is believed that the number of healthy, protected elephants in the wild is around 3,000, but just forty years ago, that number was in the region of 6,000. “With no proper monitoring in place, the population could crash and we may not find out until it’s too late”, he adds. 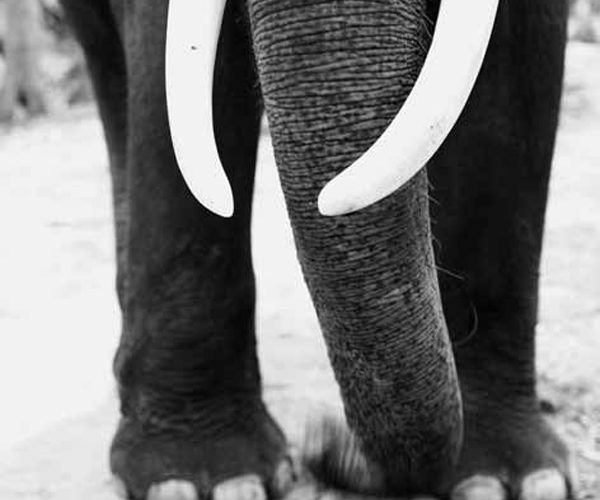 “There is some attrition due to human-elephant conflict and possibly some wild capture, although I think this is concentrated in Burma where it is still legal in certain circumstances… Our efforts and money should be concentrated on keeping them wild and helping them increase in numbers.” The challenges faced by captive elephants are not any easier to police. Simplistic solutions like blanket boycotts provide no real answer. Like Patara, the GTAEF attempts to educate visitors through thought-out and mutually beneficial experiences. 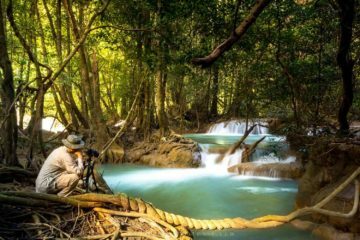 For travelers with an interest in conservation, ecology and animal welfare we wholeheartedly recommend the Patara Elephant Farm in Chiang Mai and the GTEAF, based at the Four Seasons Tented Camp Golden Triangle in Chiang Rai. To visit elephants in the wild, visit the Kui Buri Royal Project, in Hua Hin. Martin stayed at the Dhara Dhevi, Chiang Mai.